Download "FileMaker Server 14. 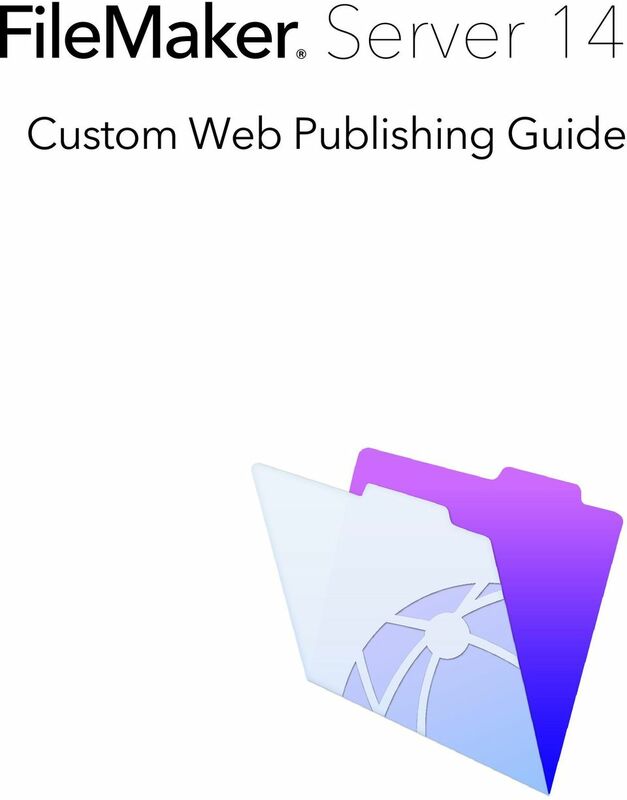 Custom Web Publishing Guide"
8 Preface About this guide This guide assumes you are experienced with using FileMaker Pro to create databases. You should understand the basics of FileMaker Pro database design and the concepts of fields, relationships, layouts, portals, and containers. For information about FileMaker Pro, see FileMaker Pro Help. This guide also assumes you are experienced with developing websites, especially with using technologies like XML or PHP to integrate FileMaker data with websites and web applications. 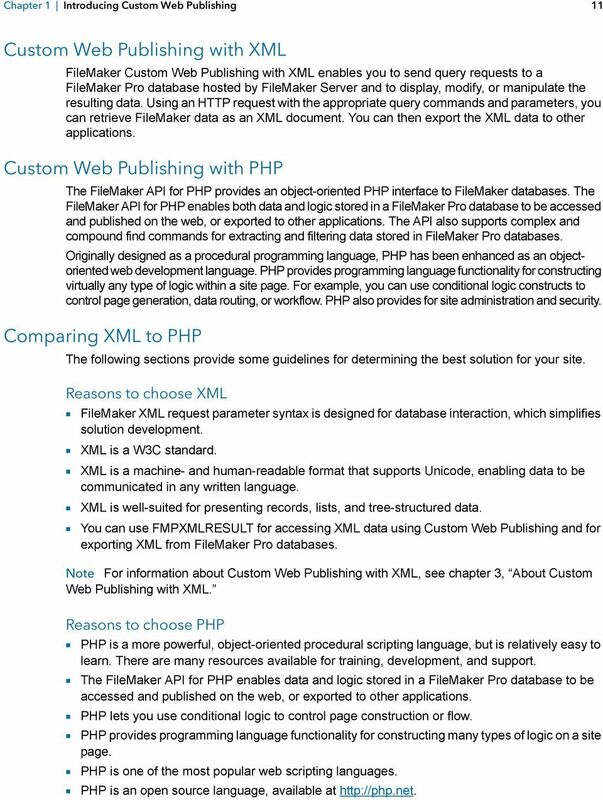 This guide provides the following information about Custom Web Publishing with FileMaker Server: 1 what is required to develop a Custom Web Publishing solution 1 how to publish your databases using XML 1 how to obtain XML data from databases hosted by FileMaker Server 1 how to publish your databases using PHP 1 how to use the FileMaker API for PHP to obtain data from databases hosted by FileMaker Server 1 what web users need to access a Custom Web Publishing solution Where to find FileMaker documentation 1 In FileMaker Server Admin Console, choose Help menu > FileMaker Server Product Documentation. 1 Click the links on the FileMaker Server Admin Console Start Page. 1 To learn about, view, or download additional FileMaker documentation, visit Online Help is accessible from FileMaker Server Admin Console. Choose Help menu > FileMaker Server Help. 9 Chapter 1 Introducing Custom Web Publishing With FileMaker Server, you can publish your FileMaker database on the Internet or an intranet in these ways. FileMaker WebDirect: With FileMaker WebDirect, you can quickly and easily publish layouts from a database on the web. You don t need to install additional software with compatible web browser software and access to the Internet or an intranet, web users can connect to your FileMaker WebDirect solution to view, edit, sort, or search records, if you give them access privileges. With FileMaker WebDirect, the host computer must be running FileMaker Server. The user interface resembles the desktop FileMaker Pro application. The web pages and forms that the web user interacts with are dependent on the layouts and views defined in the FileMaker Pro database. For more information, see FileMaker WebDirect Guide. Static publishing: If your data rarely changes, or if you don t want users to have a live connection to your database, you can use static publishing. With static publishing, you export data from a FileMaker Pro database to create a web page that you can further customize with HTML. The web page doesn t change when information in your database changes, and users don t connect to your database. (With FileMaker WebDirect, the data is updated in the web browser whenever the data is updated in the database.) For more information, see FileMaker Pro Help. 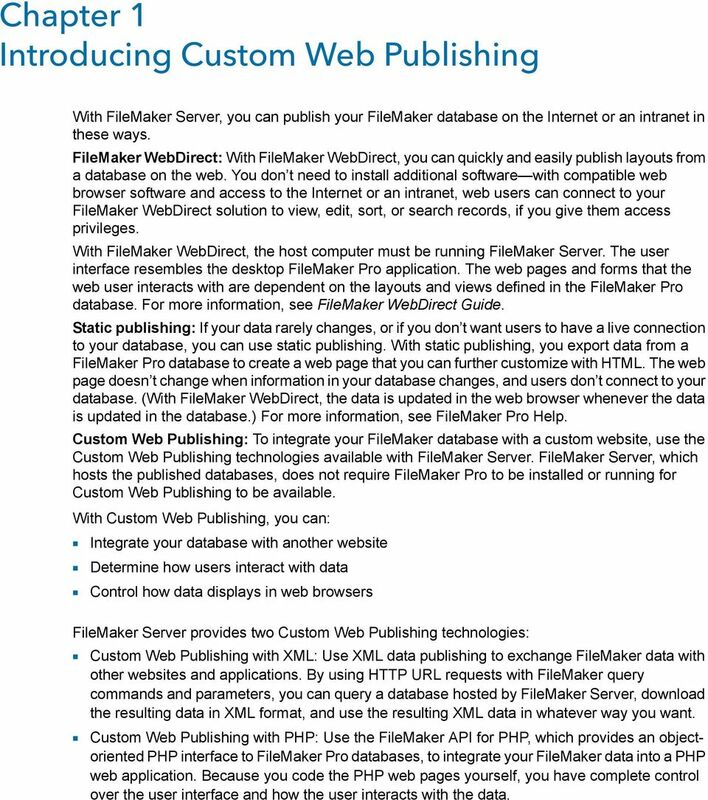 Custom Web Publishing: To integrate your FileMaker database with a custom website, use the Custom Web Publishing technologies available with FileMaker Server. FileMaker Server, which hosts the published databases, does not require FileMaker Pro to be installed or running for Custom Web Publishing to be available. With Custom Web Publishing, you can: 1 Integrate your database with another website 1 Determine how users interact with data 1 Control how data displays in web browsers FileMaker Server provides two Custom Web Publishing technologies: 1 Custom Web Publishing with XML: Use XML data publishing to exchange FileMaker data with other websites and applications. By using HTTP URL requests with FileMaker query commands and parameters, you can query a database hosted by FileMaker Server, download the resulting data in XML format, and use the resulting XML data in whatever way you want. 1 Custom Web Publishing with PHP: Use the FileMaker API for PHP, which provides an objectoriented PHP interface to FileMaker Pro databases, to integrate your FileMaker data into a PHP web application. Because you code the PHP web pages yourself, you have complete control over the user interface and how the user interacts with the data. 10 Chapter 1 Introducing Custom Web Publishing 10 About the Web Publishing Engine To support FileMaker WebDirect and Custom Web Publishing, FileMaker Server uses a set of software components called the FileMaker Server Web Publishing Engine. The Web Publishing Engine handles interactions between a web user s browser, your web server, and FileMaker Server. Custom Web Publishing with XML: Web users access your Custom Web Publishing solution by clicking an HREF link or by entering a Uniform Resource Locator (URL) that specifies the web server address and a FileMaker query string request. The Web Publishing Engine returns the XML data specified in the query string request. 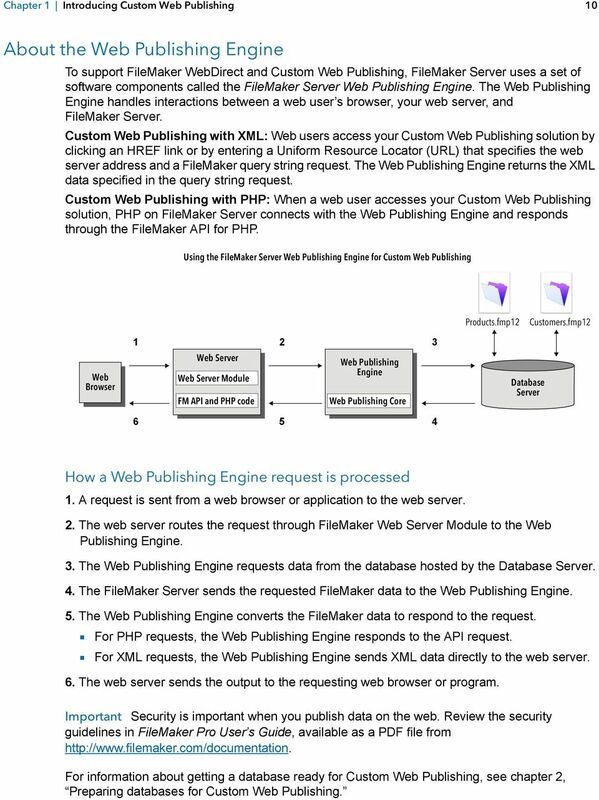 Custom Web Publishing with PHP: When a web user accesses your Custom Web Publishing solution, PHP on FileMaker Server connects with the Web Publishing Engine and responds through the FileMaker API for PHP. Using the FileMaker Server Web Publishing Engine for Custom Web Publishing Products.fmp12 Customers.fmp Web Browser Web Server Web Server Module FM API and PHP code Web Publishing Engine Web Publishing Core Database Server How a Web Publishing Engine request is processed 1. A request is sent from a web browser or application to the web server. 2. The web server routes the request through FileMaker Web Server Module to the Web Publishing Engine. 3. The Web Publishing Engine requests data from the database hosted by the Database Server. 4. The FileMaker Server sends the requested FileMaker data to the Web Publishing Engine. 5. The Web Publishing Engine converts the FileMaker data to respond to the request. 1 For PHP requests, the Web Publishing Engine responds to the API request. 1 For XML requests, the Web Publishing Engine sends XML data directly to the web server. 6. The web server sends the output to the requesting web browser or program. Important Security is important when you publish data on the web. 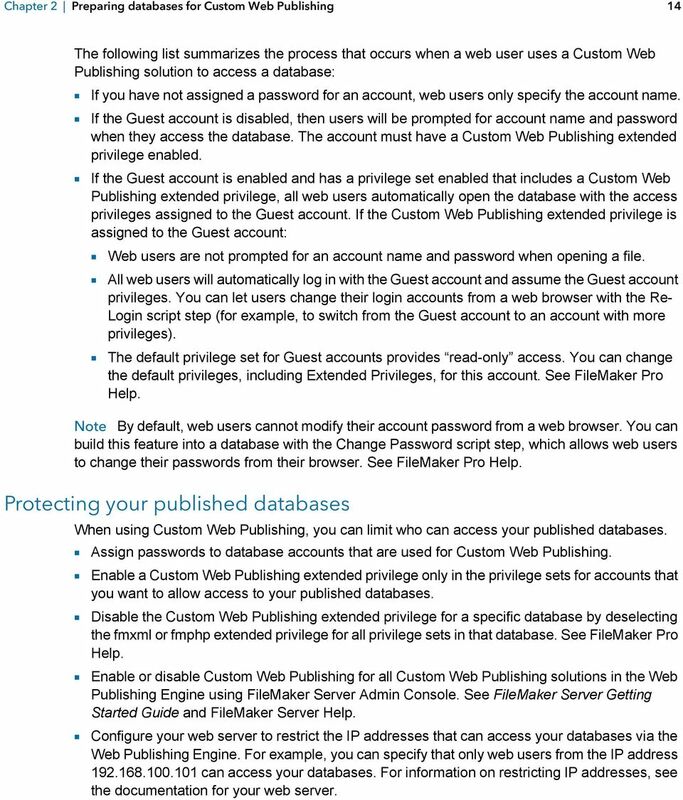 Review the security guidelines in FileMaker Pro User s Guide, available as a PDF file from For information about getting a database ready for Custom Web Publishing, see chapter 2, Preparing databases for Custom Web Publishing. 12 Chapter 1 Introducing Custom Web Publishing 12 1 PHP enables access to a wide variety of third-party components that you can integrate into your solutions. 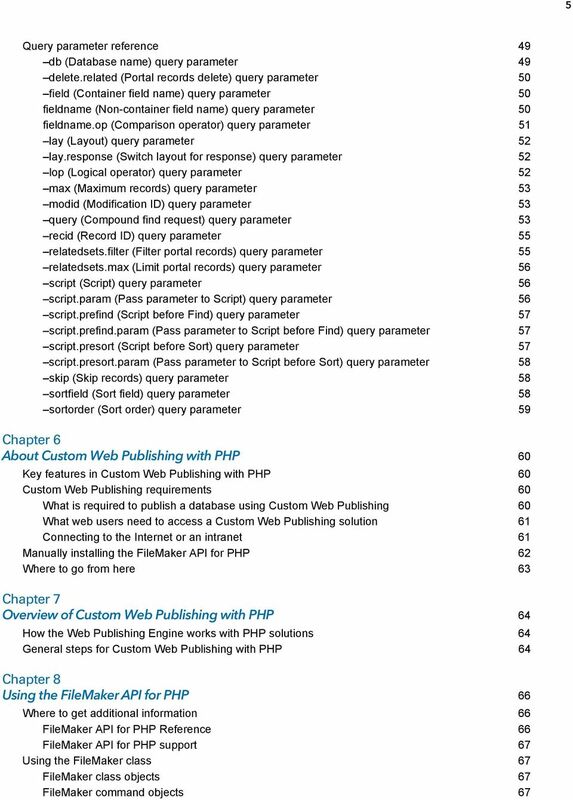 Note For information about Custom Web Publishing with PHP, see chapter 6, About Custom Web Publishing with PHP. 13 Chapter 2 Preparing databases for Custom Web Publishing Before you can use Custom Web Publishing with a database, you must prepare the database and protect it from unauthorized access. Enabling Custom Web Publishing in a database You must enable a Custom Web Publishing extended privilege in each database you want to publish. If you don t enable a Custom Web Publishing extended privilege in the database, web users won t be able to use Custom Web Publishing to access the database even if it is hosted by FileMaker Server that is configured to support a Web Publishing Engine. To enable Custom Web Publishing for a database: 1. In FileMaker Pro, open the database you want to publish using an account that has the Full Access privilege set. Alternatively, you can open the database using an account that has the Manage Extended Privileges access privileges. 2. Assign the Custom Web Publishing extended privilege that you want to use: 1 For Custom Web Publishing with XML, use fmxml 1 For Custom Web Publishing with PHP, use fmphp 3. Assign the privilege set(s) that include the Custom Web Publishing extended privilege to one or more accounts, or to the Admin or Guest account. Note When defining account names and passwords for Custom Web Publishing solutions, use printable ASCII characters, for example a-z, A-Z, and 0-9. For more secure account names and passwords, include punctuation characters such as! and %, but do not include colons. For information on setting up accounts, see FileMaker Pro Help. Accessing a protected database Custom Web Publishing enables you to restrict access to your published databases through database password protection, database encryption, and secure connections. When using a Custom Web Publishing solution to access a database, web users may be prompted for their account information. If the Guest account for the database is disabled or does not have a privilege set enabled that includes a Custom Web Publishing extended privilege, the Web Publishing Engine uses HTTP Basic Authentication to request authentication from web users. The web user s browser displays the HTTP Basic Authentication dialog box for the user to enter a user name and password for an account that has a Custom Web Publishing extended privilege. 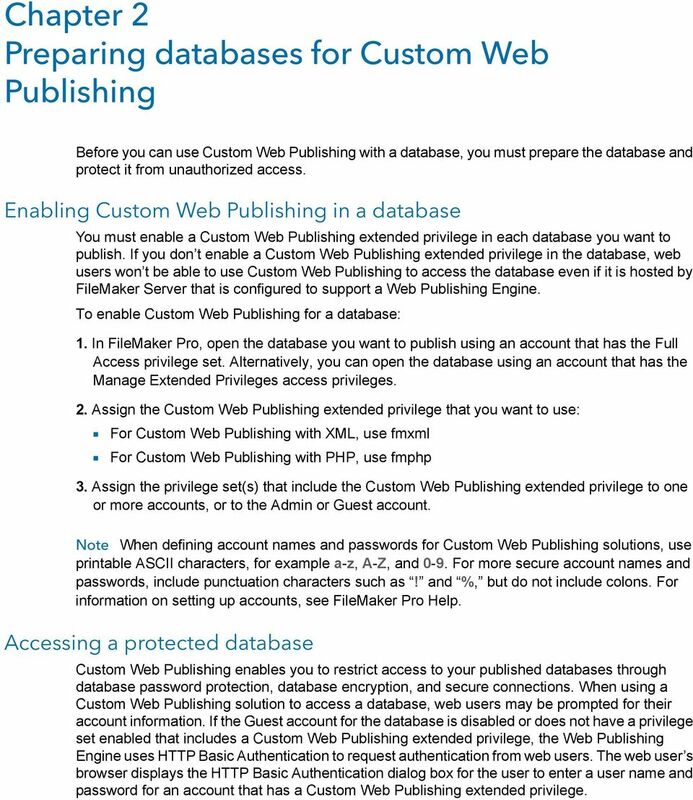 14 Chapter 2 Preparing databases for Custom Web Publishing 14 The following list summarizes the process that occurs when a web user uses a Custom Web Publishing solution to access a database: 1 If you have not assigned a password for an account, web users only specify the account name. 1 If the Guest account is disabled, then users will be prompted for account name and password when they access the database. The account must have a Custom Web Publishing extended privilege enabled. 1 If the Guest account is enabled and has a privilege set enabled that includes a Custom Web Publishing extended privilege, all web users automatically open the database with the access privileges assigned to the Guest account. If the Custom Web Publishing extended privilege is assigned to the Guest account: 1 Web users are not prompted for an account name and password when opening a file. 1 All web users will automatically log in with the Guest account and assume the Guest account privileges. You can let users change their login accounts from a web browser with the Re- Login script step (for example, to switch from the Guest account to an account with more privileges). 1 The default privilege set for Guest accounts provides read-only access. You can change the default privileges, including Extended Privileges, for this account. See FileMaker Pro Help. Note By default, web users cannot modify their account password from a web browser. You can build this feature into a database with the Change Password script step, which allows web users to change their passwords from their browser. See FileMaker Pro Help. Protecting your published databases When using Custom Web Publishing, you can limit who can access your published databases. 1 Assign passwords to database accounts that are used for Custom Web Publishing. 1 Enable a Custom Web Publishing extended privilege only in the privilege sets for accounts that you want to allow access to your published databases. 1 Disable the Custom Web Publishing extended privilege for a specific database by deselecting the fmxml or fmphp extended privilege for all privilege sets in that database. See FileMaker Pro Help. 1 Enable or disable Custom Web Publishing for all Custom Web Publishing solutions in the Web Publishing Engine using FileMaker Server Admin Console. See FileMaker Server Getting Started Guide and FileMaker Server Help. 1 Configure your web server to restrict the IP addresses that can access your databases via the Web Publishing Engine. For example, you can specify that only web users from the IP address can access your databases. For information on restricting IP addresses, see the documentation for your web server. 15 Chapter 2 Preparing databases for Custom Web Publishing 15 FileMaker Server supports encryption for data written to disk and for data transmitted to clients. 1 Encrypt your database by using the Database Encryption feature of FileMaker Pro Advanced. Encryption protects the FileMaker database file and any temporary files written to disk. For more information on encrypting a database, see FileMaker Server Getting Started Guide and FileMaker Pro Help. 1 An encrypted database that is hosted on FileMaker Server is opened by using Admin Console or the command line interface (CLI). As the FileMaker Server administrator, you open the file with its database encryption password, so that FileMaker clients can use the encrypted database. 1 Once the FileMaker encrypted database is opened with the encryption password by the FileMaker Server administrator, FileMaker clients don t need the encryption password to access the encrypted database. 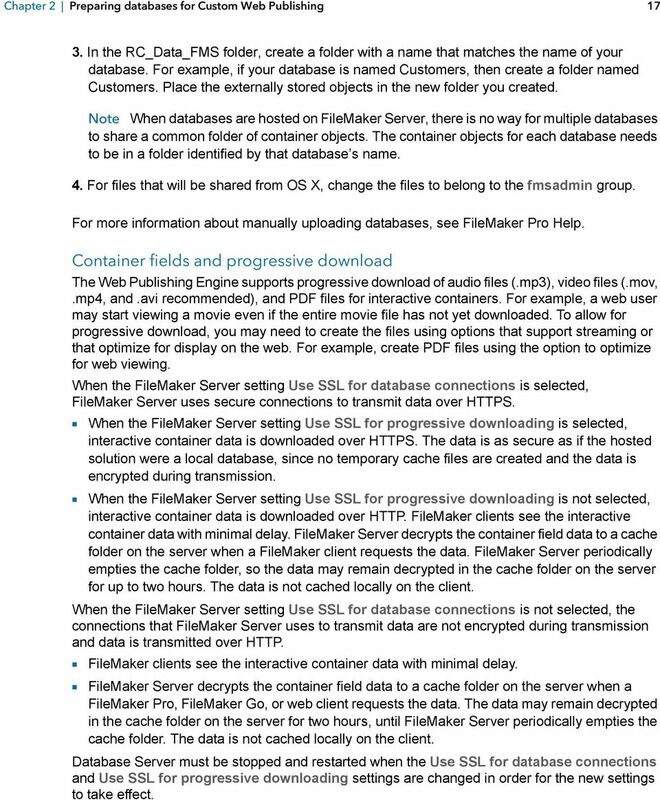 For more information about opening an encrypted database, see FileMaker Server Help. 1 Use Secure Sockets Layer (SSL) encryption for communication between the web server and web browsers. SSL connections are accessed through an HTTPS connection. FileMaker Server provides a standard SSL certificate signed by FileMaker, Inc. that does not verify the server name. The FileMaker default certificate is intended only for test purposes. A custom SSL certificate is required for production use. 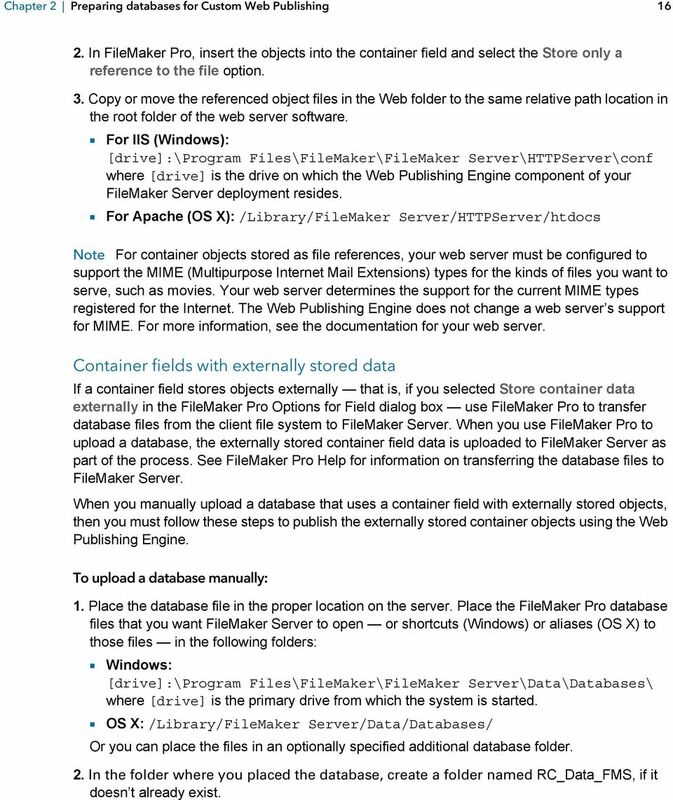 See FileMaker Server Getting Started Guide. 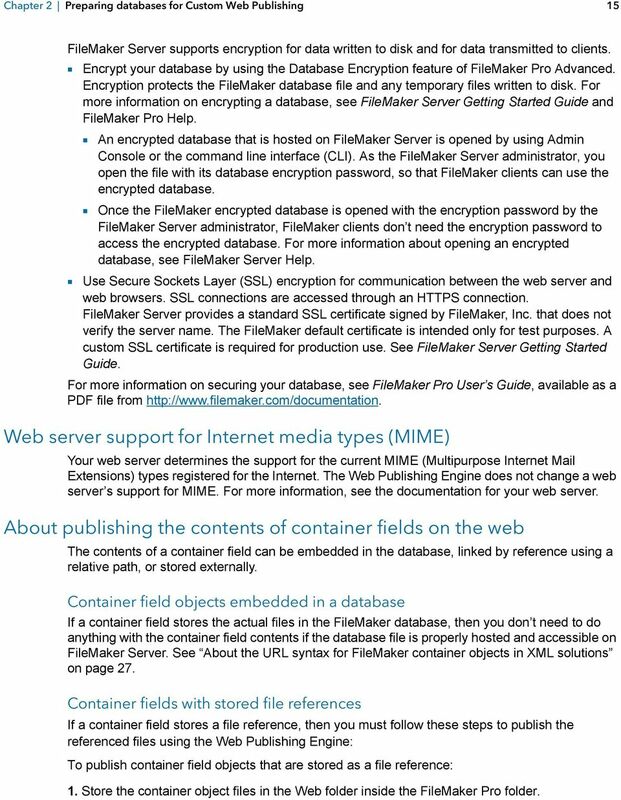 For more information on securing your database, see FileMaker Pro User s Guide, available as a PDF file from Web server support for Internet media types (MIME) Your web server determines the support for the current MIME (Multipurpose Internet Mail Extensions) types registered for the Internet. The Web Publishing Engine does not change a web server s support for MIME. For more information, see the documentation for your web server. About publishing the contents of container fields on the web The contents of a container field can be embedded in the database, linked by reference using a relative path, or stored externally. Container field objects embedded in a database If a container field stores the actual files in the FileMaker database, then you don t need to do anything with the container field contents if the database file is properly hosted and accessible on FileMaker Server. See About the URL syntax for FileMaker container objects in XML solutions on page 27. Container fields with stored file references If a container field stores a file reference, then you must follow these steps to publish the referenced files using the Web Publishing Engine: To publish container field objects that are stored as a file reference: 1. Store the container object files in the Web folder inside the FileMaker Pro folder. 16 Chapter 2 Preparing databases for Custom Web Publishing In FileMaker Pro, insert the objects into the container field and select the Store only a reference to the file option. 3. Copy or move the referenced object files in the Web folder to the same relative path location in the root folder of the web server software. 1 For IIS (Windows): [drive]:\program Files\FileMaker\FileMaker Server\HTTPServer\conf where [drive] is the drive on which the Web Publishing Engine component of your FileMaker Server deployment resides. 1 For Apache (OS X): /Library/FileMaker Server/HTTPServer/htdocs Note For container objects stored as file references, your web server must be configured to support the MIME (Multipurpose Internet Mail Extensions) types for the kinds of files you want to serve, such as movies. Your web server determines the support for the current MIME types registered for the Internet. The Web Publishing Engine does not change a web server s support for MIME. For more information, see the documentation for your web server. Container fields with externally stored data If a container field stores objects externally that is, if you selected Store container data externally in the FileMaker Pro Options for Field dialog box use FileMaker Pro to transfer database files from the client file system to FileMaker Server. When you use FileMaker Pro to upload a database, the externally stored container field data is uploaded to FileMaker Server as part of the process. See FileMaker Pro Help for information on transferring the database files to FileMaker Server. When you manually upload a database that uses a container field with externally stored objects, then you must follow these steps to publish the externally stored container objects using the Web Publishing Engine. To upload a database manually: 1. Place the database file in the proper location on the server. Place the FileMaker Pro database files that you want FileMaker Server to open or shortcuts (Windows) or aliases (OS X) to those files in the following folders: 1 Windows: [drive]:\program Files\FileMaker\FileMaker Server\Data\Databases\ where [drive] is the primary drive from which the system is started. 1 OS X: /Library/FileMaker Server/Data/Databases/ Or you can place the files in an optionally specified additional database folder. 2. In the folder where you placed the database, create a folder named RC_Data_FMS, if it doesn t already exist. 17 Chapter 2 Preparing databases for Custom Web Publishing In the RC_Data_FMS folder, create a folder with a name that matches the name of your database. For example, if your database is named Customers, then create a folder named Customers. Place the externally stored objects in the new folder you created. Note When databases are hosted on FileMaker Server, there is no way for multiple databases to share a common folder of container objects. The container objects for each database needs to be in a folder identified by that database s name. 4. For files that will be shared from OS X, change the files to belong to the fmsadmin group. For more information about manually uploading databases, see FileMaker Pro Help. Container fields and progressive download The Web Publishing Engine supports progressive download of audio files (.mp3), video files (.mov,.mp4, and.avi recommended), and PDF files for interactive containers. For example, a web user may start viewing a movie even if the entire movie file has not yet downloaded. To allow for progressive download, you may need to create the files using options that support streaming or that optimize for display on the web. For example, create PDF files using the option to optimize for web viewing. 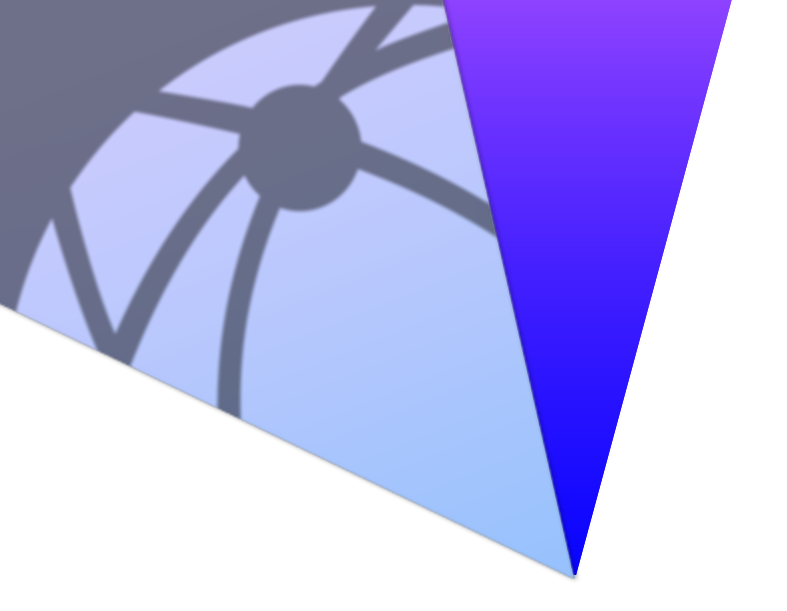 When the FileMaker Server setting Use SSL for database connections is selected, FileMaker Server uses secure connections to transmit data over HTTPS. 1 When the FileMaker Server setting Use SSL for progressive downloading is selected, interactive container data is downloaded over HTTPS. The data is as secure as if the hosted solution were a local database, since no temporary cache files are created and the data is encrypted during transmission. 1 When the FileMaker Server setting Use SSL for progressive downloading is not selected, interactive container data is downloaded over HTTP. FileMaker clients see the interactive container data with minimal delay. FileMaker Server decrypts the container field data to a cache folder on the server when a FileMaker client requests the data. FileMaker Server periodically empties the cache folder, so the data may remain decrypted in the cache folder on the server for up to two hours. The data is not cached locally on the client. When the FileMaker Server setting Use SSL for database connections is not selected, the connections that FileMaker Server uses to transmit data are not encrypted during transmission and data is transmitted over HTTP. 1 FileMaker clients see the interactive container data with minimal delay. 1 FileMaker Server decrypts the container field data to a cache folder on the server when a FileMaker Pro, FileMaker Go, or web client requests the data. The data may remain decrypted in the cache folder on the server for two hours, until FileMaker Server periodically empties the cache folder. The data is not cached locally on the client. Database Server must be stopped and restarted when the Use SSL for database connections and Use SSL for progressive downloading settings are changed in order for the new settings to take effect. 18 Chapter 2 Preparing databases for Custom Web Publishing 18 How web users view container field data When you publish a database using the Web Publishing Engine, the following limitations apply to container field objects: 1 Web users cannot modify or add to the contents of container fields. Web users cannot use container fields to upload objects to the database. 1 For databases that use a container field with thumbnails enabled, the Web Publishing Engine downloads the full file, not a thumbnail. FileMaker scripts and Custom Web Publishing The Manage Scripts feature in FileMaker Pro can automate frequently performed tasks and combine several tasks. When used with Custom Web Publishing, FileMaker scripts allow web users to perform more tasks or a series of tasks. 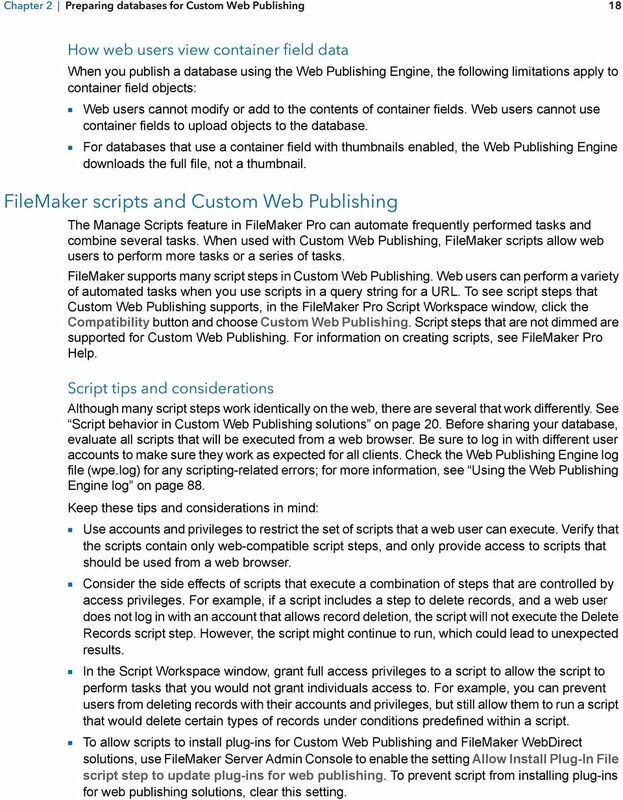 FileMaker supports many script steps in Custom Web Publishing. Web users can perform a variety of automated tasks when you use scripts in a query string for a URL. To see script steps that Custom Web Publishing supports, in the FileMaker Pro Script Workspace window, click the Compatibility button and choose Custom Web Publishing. Script steps that are not dimmed are supported for Custom Web Publishing. For information on creating scripts, see FileMaker Pro Help. Script tips and considerations Although many script steps work identically on the web, there are several that work differently. See Script behavior in Custom Web Publishing solutions on page 20. Before sharing your database, evaluate all scripts that will be executed from a web browser. Be sure to log in with different user accounts to make sure they work as expected for all clients. Check the Web Publishing Engine log file (wpe.log) for any scripting-related errors; for more information, see Using the Web Publishing Engine log on page 88. Keep these tips and considerations in mind: 1 Use accounts and privileges to restrict the set of scripts that a web user can execute. Verify that the scripts contain only web-compatible script steps, and only provide access to scripts that should be used from a web browser. 1 Consider the side effects of scripts that execute a combination of steps that are controlled by access privileges. For example, if a script includes a step to delete records, and a web user does not log in with an account that allows record deletion, the script will not execute the Delete Records script step. However, the script might continue to run, which could lead to unexpected results. 1 In the Script Workspace window, grant full access privileges to a script to allow the script to perform tasks that you would not grant individuals access to. For example, you can prevent users from deleting records with their accounts and privileges, but still allow them to run a script that would delete certain types of records under conditions predefined within a script. 1 To allow scripts to install plug-ins for Custom Web Publishing and FileMaker WebDirect solutions, use FileMaker Server Admin Console to enable the setting Allow Install Plug-In File script step to update plug-ins for web publishing. To prevent script from installing plug-ins for web publishing solutions, clear this setting. 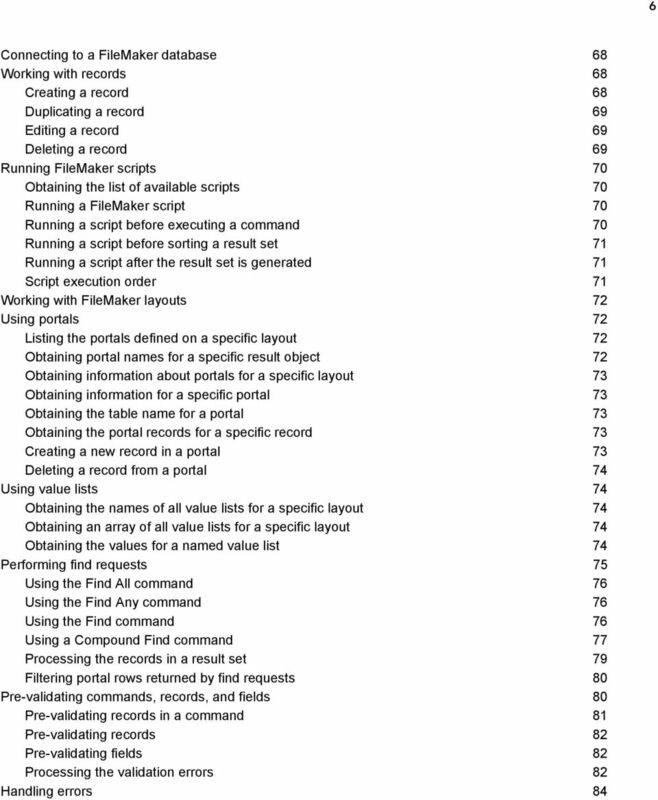 19 Chapter 2 Preparing databases for Custom Web Publishing 19 1 If your scripts contain unknown steps for example, steps that are obsolete or are not recognized running these script steps returns FileMaker Pro error 4 ( Command is unknown ). Use the Allow User Abort script step to determine how subsequent steps are handled: 1 If the Allow User Abort script step option is enabled (on), unknown script steps stop the script from continuing. 1 If Allow User Abort is disabled (off), unknown script steps are skipped and the script continues to execute. 1 If Allow User Abort is not included, scripts are executed as if Allow User Abort were enabled, so unknown script steps stop scripts. 1 If your scripts contain unsupported steps for example, steps that are not webcompatible running these script steps returns FileMaker Pro error 3 ( Command is unavailable ). These unsupported script steps are skipped and the script continues to execute. In FileMaker 14, the Allow User Abort script step has no impact on the behavior of unsupported script steps. 1 Some scripts that work with one step from a FileMaker Pro client may require an additional Commit Record/Request script step to save the data to the host. Because web users don t have a direct connection to the host, they aren t notified when data changes. For example, features like conditional value lists aren t as responsive for web users because the data must be saved to the host before the effects are seen in the value list field. 1 Any script that modifies data should include the Commit Record/Request script step, because data changes aren t visible in the browser until the data is saved or submitted to the server. This includes several script steps like Cut, Copy, and Paste. Many single-step actions should be converted into scripts to include the Commit Record/Request step. When designing scripts that will be executed from a web browser, include the Commit Record/Request step at the end of a script to make sure all changes are saved. 1 To create conditional scripts based on the type of client, use the Get(ApplicationVersion) function. If the value returned includes a Web Publishing Engine string, then you know that the current user is accessing your database with Custom Web Publishing. For more information on functions, see FileMaker Pro Help. 1 Open each script that web users might run and verify that the script will execute properly when the database is hosted as a Custom Web Publishing solution. 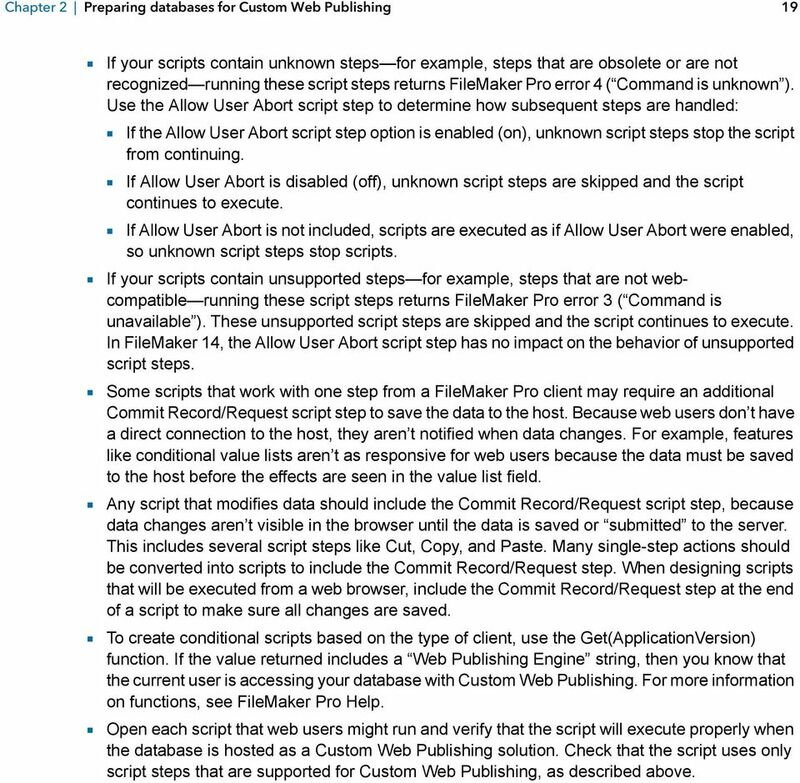 Check that the script uses only script steps that are supported for Custom Web Publishing, as described above. 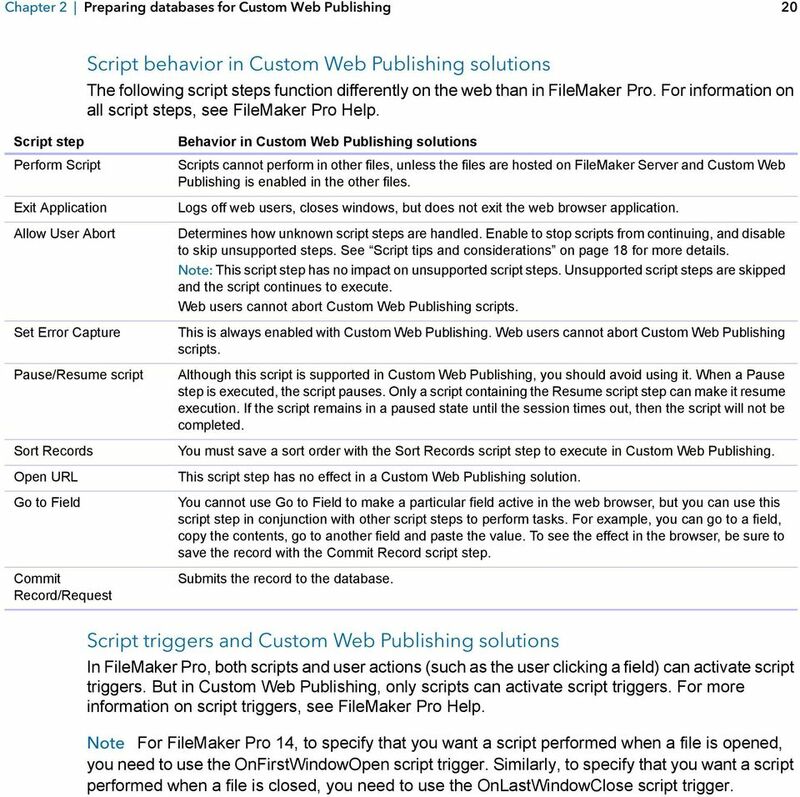 20 Chapter 2 Preparing databases for Custom Web Publishing 20 Script behavior in Custom Web Publishing solutions The following script steps function differently on the web than in FileMaker Pro. For information on all script steps, see FileMaker Pro Help. Script step Perform Script Exit Application Allow User Abort Set Error Capture Pause/Resume script Sort Records Open URL Go to Field Commit Record/Request Behavior in Custom Web Publishing solutions Scripts cannot perform in other files, unless the files are hosted on FileMaker Server and Custom Web Publishing is enabled in the other files. Logs off web users, closes windows, but does not exit the web browser application. Determines how unknown script steps are handled. Enable to stop scripts from continuing, and disable to skip unsupported steps. See Script tips and considerations on page 18 for more details. Note: This script step has no impact on unsupported script steps. Unsupported script steps are skipped and the script continues to execute. Web users cannot abort Custom Web Publishing scripts. This is always enabled with Custom Web Publishing. Web users cannot abort Custom Web Publishing scripts. Although this script is supported in Custom Web Publishing, you should avoid using it. When a Pause step is executed, the script pauses. Only a script containing the Resume script step can make it resume execution. If the script remains in a paused state until the session times out, then the script will not be completed. You must save a sort order with the Sort Records script step to execute in Custom Web Publishing. This script step has no effect in a Custom Web Publishing solution. You cannot use Go to Field to make a particular field active in the web browser, but you can use this script step in conjunction with other script steps to perform tasks. For example, you can go to a field, copy the contents, go to another field and paste the value. To see the effect in the browser, be sure to save the record with the Commit Record script step. Submits the record to the database. Script triggers and Custom Web Publishing solutions In FileMaker Pro, both scripts and user actions (such as the user clicking a field) can activate script triggers. But in Custom Web Publishing, only scripts can activate script triggers. For more information on script triggers, see FileMaker Pro Help. Note For FileMaker Pro 14, to specify that you want a script performed when a file is opened, you need to use the OnFirstWindowOpen script trigger. Similarly, to specify that you want a script performed when a file is closed, you need to use the OnLastWindowClose script trigger. 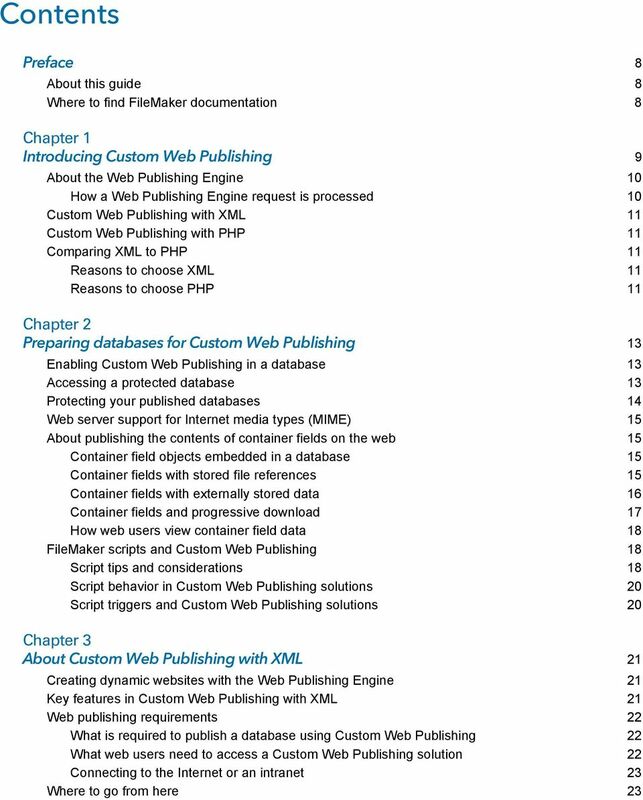 22 Chapter 3 About Custom Web Publishing with XML 22 1 You can pass a parameter value to a FileMaker script. For more information, see script.param (Pass parameter to Script) query parameter on page 56, script.prefind.param (Pass parameter to Script before Find) query parameter on page 57, and script.presort.param (Pass parameter to Script before Sort) query parameter on page The fmresultset XML grammar enables you to access fields by name and manipulate relatedset (portal) data. 1 To access data in a database, you must specify a layout. See chapter 5, Valid names used in XML query strings, Web publishing requirements What is required to publish a database using Custom Web Publishing To publish databases using Custom Web Publishing with XML, you need: 1 a FileMaker Server deployment that includes: 1 a web server, either Microsoft IIS (Windows) or Apache (OS X) 1 the FileMaker Database Server, enabled for Custom Web Publishing 1 the Web Publishing Engine, installed and configured 1 one or more FileMaker Pro databases hosted by FileMaker Server 1 the IP address or domain name of the host running the web server 1 a web browser and access to the web server to develop and test your Custom Web Publishing solution For more information, see FileMaker Server Getting Started Guide. What web users need to access a Custom Web Publishing solution To access a Custom Web Publishing solution that uses XML, web users need: 1 a web browser 1 access to the Internet or an intranet and the web server 1 the IP address or domain name of the host running the web server If the database is password-protected, web users must also enter a user name and password for a database account. 23 Chapter 3 About Custom Web Publishing with XML 23 Connecting to the Internet or an intranet When you publish databases on the Internet or an intranet, the host computer must be running FileMaker Server, and the databases you want to share must be hosted and available. In addition: 1 Publish your database on a computer with a full-time Internet or intranet connection. You can publish databases without a full-time connection, but they are only available to web users when your computer is connected to the Internet or an intranet. 1 The host computer for the web server that is part of the FileMaker Server deployment must have a dedicated static (permanent) IP address or a domain name. If you connect to the Internet with an Internet service provider (ISP), your IP address might be dynamically allocated (it is different each time you connect). A dynamic IP address makes it more difficult for web users to locate your databases. If you are not sure of the type of access available to you, consult your ISP or network administrator. Where to go from here Here are some suggestions to get started developing Custom Web Publishing solutions: 1 If you haven t already done so, use FileMaker Server Admin Console to enable Custom Web Publishing. 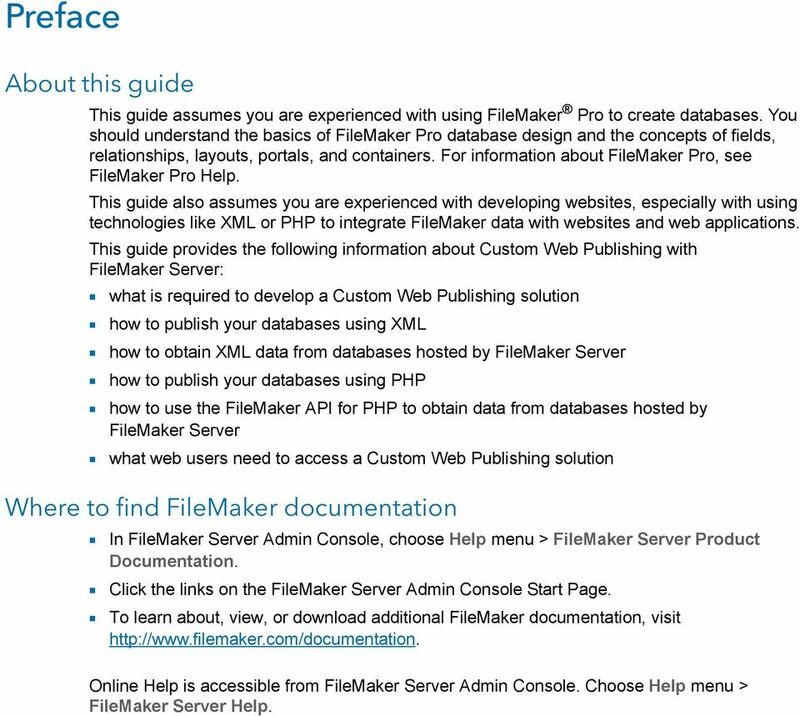 See FileMaker Server Help and FileMaker Server Getting Started Guide. 1 In FileMaker Pro, open each FileMaker database that you want to publish and make sure the database has the appropriate extended privilege(s) enabled for Custom Web Publishing. 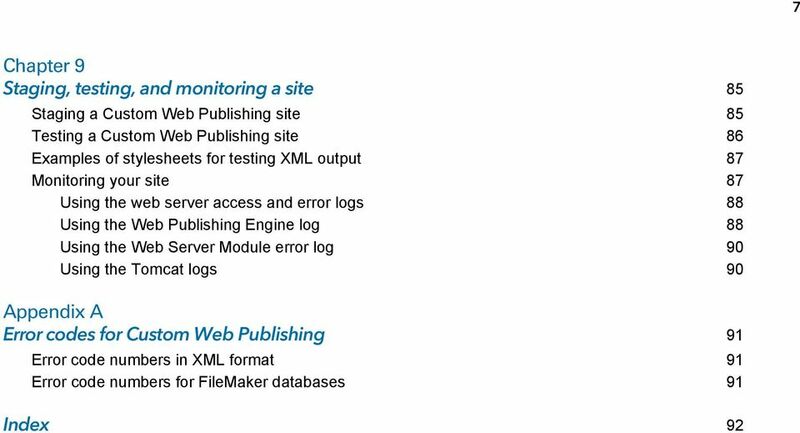 See Enabling Custom Web Publishing in a database on page To learn how to access data in FileMaker databases using XML, see Accessing XML data via the Web Publishing Engine on page 28. 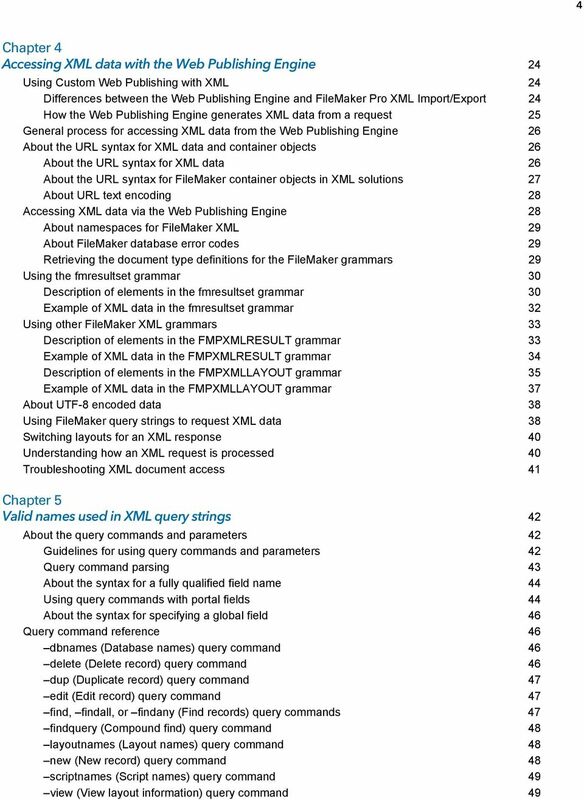 24 Chapter 4 Accessing XML data with the Web Publishing Engine You can obtain and update FileMaker data in Extensible Markup Language (XML) format by using the Web Publishing Engine. In the same way that HTML has become the standard display language for communication on the World Wide Web, XML has become the standard language for structured data interchange. Many individuals, organizations, and businesses use XML to transfer product information, transactions, inventory data, and other business data. Using Custom Web Publishing with XML If you know standard XML, you can start using the Web Publishing Engine after learning a few unique details about Custom Web Publishing with XML, such as the URL syntax and query parameters to use. By using HTTP URL requests with FileMaker query commands and parameters, you can query a database hosted by FileMaker Server and download the resulting data in XML format. For example, you can query a database for all records in a certain postal code, and use the resulting XML data in whatever way you want to. For more information, search the FileMaker Knowledge Base available at Note The Web Publishing Engine generates XML data that is well-formed and compliant with the XML 1.0 specification. For details about the requirements for well-formed XML, see the XML specification, which is available at Differences between the Web Publishing Engine and FileMaker Pro XML Import/Export The Web Publishing Engine and FileMaker Pro both enable you to use XML data with FileMaker databases. There are, however, some important differences between the two methods: 1 For accessing XML data, the Web Publishing Engine supports the fmresultset, FMPXMLRESULT, and FMPXMLLAYOUT grammars. For XML import, FileMaker Pro uses the FMPXMLRESULT grammar, and for export, FileMaker Pro uses the FMPXMLRESULT grammar. See Accessing XML data via the Web Publishing Engine on page To access XML data with the Web Publishing Engine, you use a Web Publishing Engine query string in a URL. To import and export XML with FileMaker Pro, you use FileMaker Pro menu commands or scripts. 1 The Web Publishing Engine is server-based and can be installed on the same or a different host than FileMaker Server. FileMaker Pro XML import and export is desktop-based. 1 You can dynamically access XML data from FileMaker databases by using URL requests with the Web Publishing Engine. The FileMaker Pro XML export feature generates a pre-specified XML data file. 1 Working with XML data via the Web Publishing Engine is an interactive operation. FileMaker Pro XML import and export is a batch operation. FileMaker 14 WebDirect Guide 2015 FileMaker, Inc. All Rights Reserved. FileMaker, Inc. 5201 Patrick Henry Drive Santa Clara, California 95054 FileMaker and FileMaker Go are trademarks of FileMaker, Inc.
FileMaker 11 Instant Web Publishing Guide 2004 2010 FileMaker, Inc. All Rights Reserved. FileMaker, Inc. 5201 Patrick Henry Drive Santa Clara, California 95054 FileMaker is a trademark of FileMaker, Inc.
FileMaker Server 7 and FileMaker Server 7 Advanced Documentation Errata The following pages clarify information or correct errors in the FileMaker Server 7 and FileMaker Server 7 Advanced documentation. Only LDAP-synchronized users can access SAML SSO-enabled web applications. Local end users and applications users cannot access them.